No! I'm not having twins!! 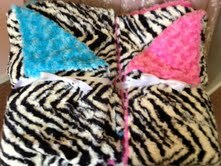 I made surprise blankets for twins! I wish you could feel how yummy these blankets are! These girls are so fun and a blast to be around. They just turned 12 and love my minky blankets! Happy Birthday Emily & Aubree!